From everyone here at Mid-America Catastrophe, we formally invite you to attend our 2016 claims conference. 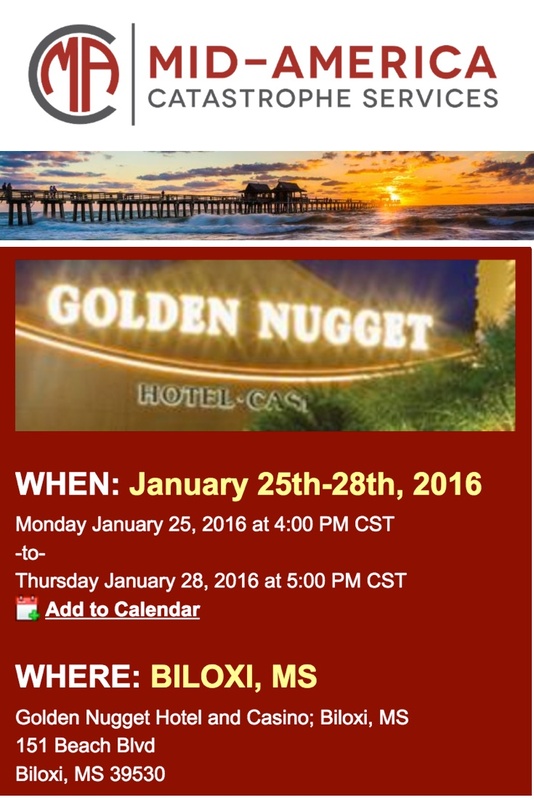 The conference will be Jan. 26th, 27th and 28th at the Golden Nugget Hotel and Casino, in Biloxi, MS. Registration will be on Jan 25th between 4-7 pm, with a reception, including food and live music to follow at La Maison Gautier "The Old Place," 2800 Oak Street, Gautier, Mississippi 39553. Cost is $115 per person, and includes a raffle to win a Yeti cooler, Ipad and other great items! This does not include hotel rooms. See below for rooms & discount info. There will be a golf tournament on Jan 25th, at The Oaks Golf Club at 9AM, at a cost of $65! You will have a chance to register and pay for the golf tournament in the main registration form, by clicking below. Deadline for early registration, including guaranteed room rate and a free t-shirt is Jan 7th. Golf Tournament begins at 9am!!! The Oaks Golf Club. 24384 Club House Dr, Pass Christian, MS 39571. We have our golf tournament set up at one of the finest Gulf Coast Golf Courses. The cost to play will be $65.00, including cart and green fees. Don't miss out on a great opportunity to have a blast on a very nice and challenging course. There will be prizes for 1st and 2nd place and SEVERAL RAFFLE PRIZES. Mulligans will be for sale at $5 each or 5 for $20 and will bs used in the raffle drawing. Registration: From 4pm-7pm La Maison Gautier "The Old Place," 2800 Oak Street, Gautier, Mississippi 39553. A reception including dinner and live music, wiill follow. Client Certification- St. Johns Insurance Co. Client Certification- Centauri Insurance Co.